Please tap or click image to enlarge. Timed by the New Moon @8Tau14 on April 28, 1881, this chart may be used to represent those plutocrats whose progeny, both biological and philosophical, continue to lord it over the American people as if plutocrats are monarchs--you know, the 1% of wealthy elitists in the US, many of whom owe their power and extreme wealth to ancestors whose vast fortunes were made or increased during the last 20 years of the 19th century: Carnegies, Rockefellers, Morgans, etc, with the Rothschilds hiding behind the velvet curtain of privilege as well. 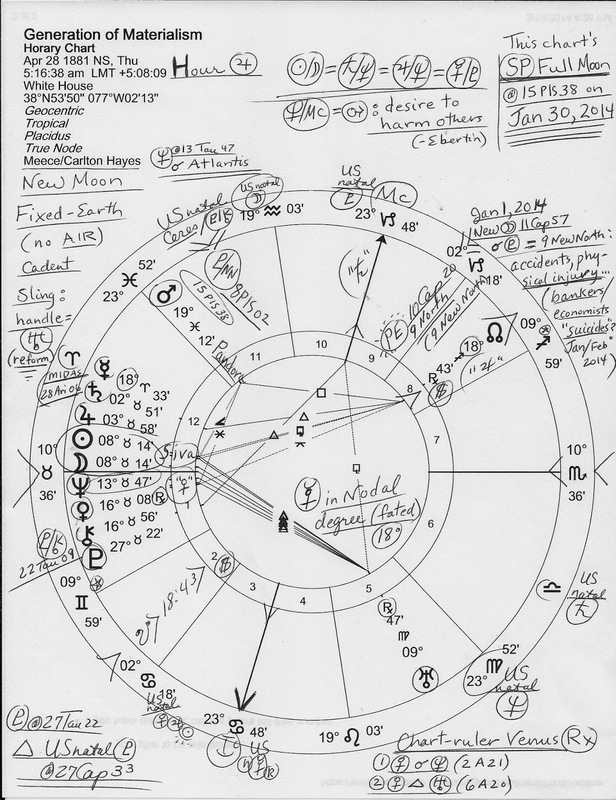 Marked upon the outside of the chart is the January 1, 2014 New Moon @11Cap57 which conjoined transiting Pluto for it hit the Robber Barons' Pre-Natal Solar Eclipse degree (10Cap20) in the 9 New North Saros Series. Capricorn is, of course, the sign of old men, government, law, and business, and the 9NN Series denotes accidents, physical injuries, and safety issues (Brady); this has me wondering if the New Years Day 2014 lunation in gilt-edged Capricorn ushered in the mysterious deaths ruled 'suicides' of several bankers and financial workers, plus, a missing DOW-Jones reporter, all during January and February 2014--so far. If you haven't, see 3 JP Morgan workers suffer mysterious deaths and Dead Bankers, Missing Reporter...Something's Amiss . The reason I post today the Generation of Materialism natal horoscope timed by the New Moon that occurred just after societal planets Jupiter and Saturn conjoined in early Taurus (a money sign) on April 18, 1881 is that its degree will be triggered by the Solar Eclipse of April 29, 2014 @8Tau51. As you can see in the horoscope of the Eclipse, below, Mercury @12Tau31 is nearby in 3rd house of Communications, Transport, Neighborhoods, Siblings, and Early Education. Mercury, the Orator, also conjoins deceptive Neptune in the 1881 chart in which Neptune rises indicating conditions out of control and possibly water, oil, and/or gas issues with a potential for poisonous conditions. Since we already have toxic conditions in West Virginia, North Carolina, and elsewhere, we may expect the April 29, 2014 to bring these concerns even more front and center with hopefully no further environmental catastrophes to deal with. Note: coal-ash-spilling Duke Energy was founded in 1904. Well, the 1881 New Moon and the 2014 Eclipse degrees would conjunct since there's only one day between April 28th and 29th! The April 29, 2014 Solar Eclipse perfects during a Jupiter Hour and chart-ruler Venus (ASC 10Tau36, chart set for the White House) will conjoin the eclipse Neptune and trine eclipse Uranus--both Venus-Neptune and Venus-Uranus have links to money, evaluation, and relationship issues, as inspired, deceptive, or separative as they may be. 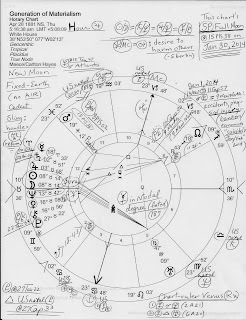 Plus, you see that US natal Pluto @27Cap33 is at eclipse MC (The Goal) Point of the chart which puts our natal Mercury-Pluto opposition (spies, secrets, surveillance, propaganda and control of information) on the MC-IC axis of Home-Career-Security. Additionally, America's natal 12th cusp of Politics, Karma, Secret Deals, and Large Institutions is at MC as well so the Solar Eclipse may expose a few more secrets (12th h) concerning the Keystone XL Pipeline with other worries of a toxic water and contagion nature especially with contagious Neptune rising in 1st house. 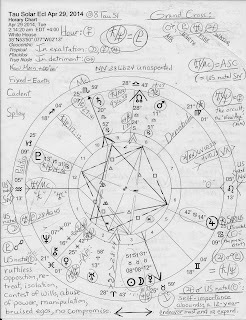 And yes, the Cardinal Grand Cross between Mars Rx in 8th house of Corporatism and Debt, Pluto in 12th house of Politics and Karma--and still opposing US natal Sun, radical Uranus in 2nd house of the National Treasury (a blindly zealous Utopian when in Mars-ruled Aries, says Ebertin), and Jupiter conjunct The Scorcher, SIRIUS, in 6th house of Military and Police Forces, Health, and Work is a large part of the eclipse scenario. 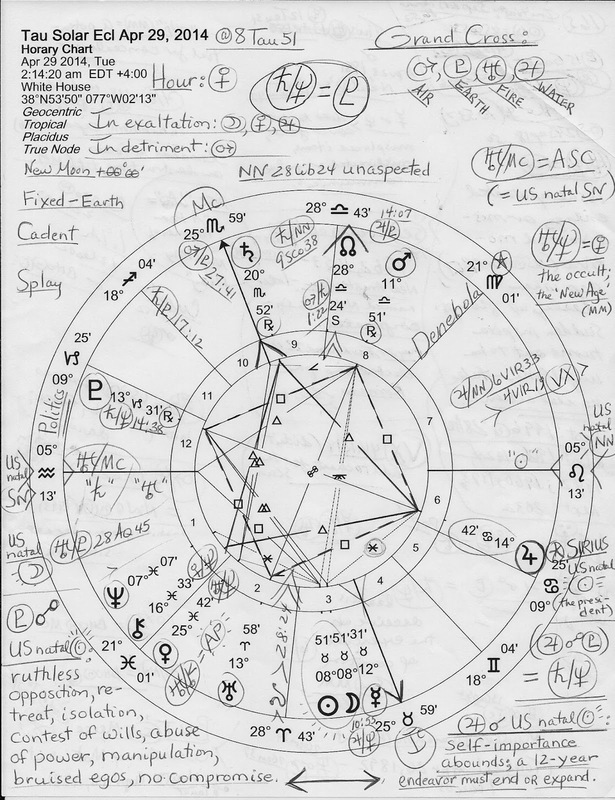 If its energies are handled maturely and carefully, a Grand Cross pattern indicates tremendous success though there is much antagonism, tension, and poorly planned actions along with way to wisdom and a draining of energy may be problematic (nuclear leaks come to mind.) The pattern's Cardinal quality shows a need for cooperation from others for there are crucial karmic lessons involved within the social awareness denoted here. Well, it seems that if the American people are to hope for such wisdom to be directed at solving the dire problems and toxic conditions of the day, we must depend upon the behavior of Washington politicians who have the 2014 November Elections hanging over their heads and thus determining their courses, internal party squabbles notwithstanding. Plus, it seems We the People will be depending upon congress members who aren't retiring or stepping down soon. It seems feasible that some members are ethically challenged and are clearing out before the dreaded sheriff knocks on the door--you know, like the Federal Grand Jury that ran Georgia Governor Nathan Deal from Capitol Hill in 2010! For further reading on the Generation of Materialism and many other topics, see E. Alan Meece's book, Horoscope for the New Millennium.